DEARBORN, Mich., Jan. 30, 2017 – The 2017 Ford F-250 Super Duty Crew Cab 4x2’s smart engineering has earned the all-new truck the government’s highest possible crash rating of five stars – adding safety to its strengths as the toughest, smartest, most capable Super Duty ever. 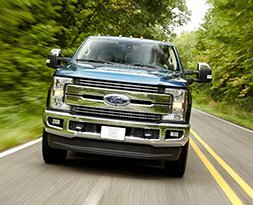 The 2017 F-Series Super Duty is the only heavy-duty pickup truck to earn National Highway Traffic Safety Administration’s highest safety rating. Thanks to its robust design, advanced materials and safety features developed by the Ford truck team, the 2017 model earns a five-star overall vehicle score in the agency’s New Car Assessment Program, as well as a five-star rating for frontal driver crash tests. Side crash ratings for front and rear remain five stars. Super Duty’s improved performance is enabled by weight savings of up to 350 pounds through the use of high-strength, military-grade, aluminum alloy in the body and box. This leads to more local frame stiffness at strategic locations to deliver considerable improvement in occupant protection. The weight savings is then reinvested into an all-new fully boxed frame that is more than 95 percent high-strength steel and up to 24 times stiffer than the previous frame. But Ford didn’t stop with the truck’s body and frame – Super Duty sets a new level of technology availability for the segment. Options such as 360-degree camera system, adaptive cruise control with collision mitigation, lane-keeping alert and inflatable seatbelts help the driver to have more confidence and control while towing and hauling heavy loads from job site to job site.